I’ve found a very interesting and useful website that displays the front cover of thousands of newspapers throughout the whole world. 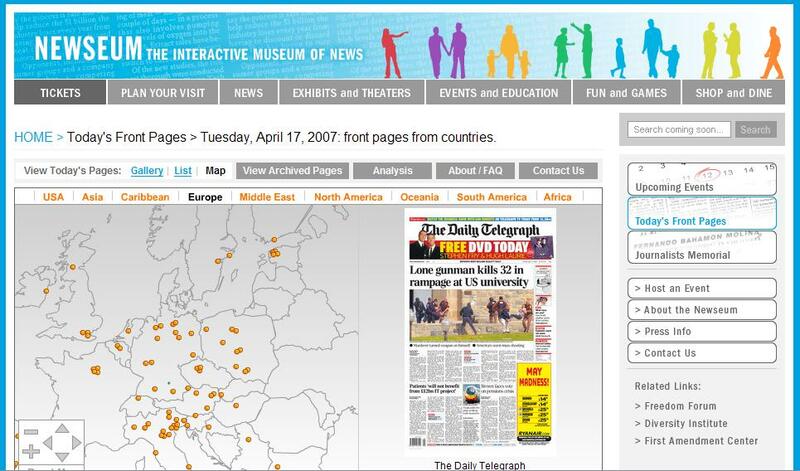 The site is Newseum.org. This is a great tool for catching breaking news around the world. Its interface is intuitive and displays the covers by just passing the mouse on top of the desired city. Today you can see how the news of the Virginia Massacre reached the front pages of not only all the US newspapers, but a vast amount of European newspapers. Contextual Advertising Conference Speech Will we find a bottom?